I love working with paper! My father was a papermaker and I grew up appreciating its qualities. Now, much to his amusement, I layer it, wax it, steam it, oil it and most strangely stitch it! I usually work large scale but because my time in the studio is limited I work in modules, making smaller achievable units which I can link together in a variety of ways. This year I have seen many people affected by the budget cuts to services. Individuals and families have responded by telling their own unique story. 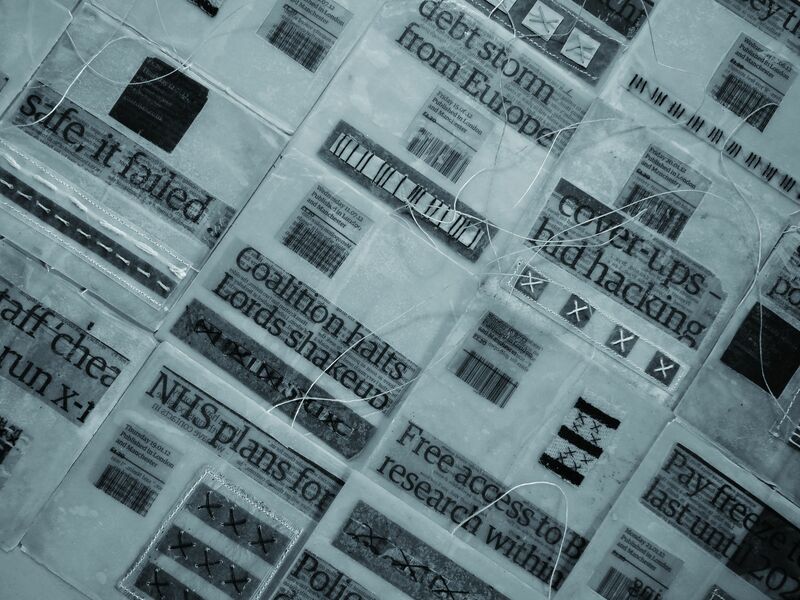 The waxed squares in my latest work contain the headlines of these stories. Each square is built up with layers of paper. Words are hidden, and tiny stitches represent words. The implications of these decisions are slowly unfolding stories.